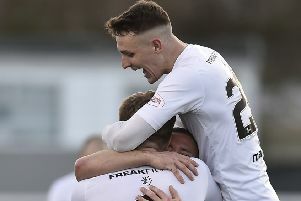 League leaders Edinburgh City took full advantage of the only match in Ladbrokes League Two to survive the weather to register a 3-1 win over Albion Rovers and open up a four-point gap over Peterhead at the top. 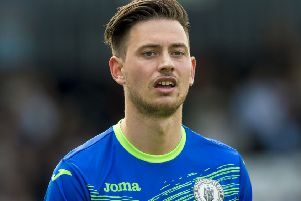 However, things got off to a shaky start at Ainslie Park as the division’s bottom club opened the scoring through on-loan Motherwell striker George Newell, son of former Aberdeen and Blackburn frontman Mike, after 19 minutes. City weren’t behind for long though as a terrific Allan Smith header drew James McDonaugh’s men level six minutes later and the hosts swung the match in their favour as Jack Breen, who joined on loan from Hamilton earlier this month, capitalised on a defensive error as goalkeeper Peter Morrison’s attempted clearance ricocheted off the teenager and into the empty net. Blair Henderson sealed victory with his 31st goal of the season 12 minutes into the second half, controlling a wonderful cross from Craig Thomson and unleashing a powerful effort that crashed in off the underside of the crossbar. Although thrilled to pick up another three points, McDonaugh reserved special praise for the Spartans groundstaff who worked tirelessly on the pitch to ensure the match went ahead. “We’re really grateful to the staff at Spartans who worked all morning to get the game on in the first place,” he said. “We knew all the other fixtures had been called off so we had to grasp the opportunity to extend our lead. If the other teams win their games in hand then they’ll go ahead of us but at the moment we’re still top. At the opposite end of the table, Albion are fighting for their lives so it wasn’t in the script when the Coatbridge outfit struck first. A Gregor Fotheringham corner wasn’t dealt with by the City rearguard and Newell was there to head past goalkeeper Calum Antell. Their lead was short-lived however, as Thomson’s pinpoint delivery from near the touchline was glanced home by Smith, who had timed his run to perfection. And the hosts were ahead just eight minutes later through some calamitous defending from Albion. Jason Krones chose to involve his goalkeeper when the defender should have cleared his lines. Breen, 19, anticipated the pass and closed down his opponent, the visiting No.1 then kicking the ball straight off the midfielder and into the empty net. There was no fortune about City’s third 12 minutes after the restart. Thomson was again the architect as he picked out talisman Henderson, who weaved his way past a defender before unleashing a ferocious effort that swerved over Morrison, hitting the bar on its way in. McDonaugh revealed afterwards he was delighted if somewhat surprised there was no interest in the SPFL’s second top goalscorer last month. “There were no bids or anything like that for him, which I was surprised about,” McDonaugh admitted. “There are parts of his game he knows he has to improve. But I do know he’s happy here. For a player that has played for so many clubs, he’s still young. Albion, who have now gone 14 games without a win, carved out some decent opportunities in the closing stages with Ben Reilly seeing his half volley from 20 yards come crashing back off the bar. However, City can now turn their attentions to Saturday’s top-of-the-table clash at Peterhead. “It’s a big one, there’s no point playing it down but nothing will be decided. If we can go up there and avoid defeat then we’ll stay top,” McDonaugh added. Former Hibs winger and Albion boss Kevin Harper said: “It feels as if I’m saying the same things all the time to the players. The mistakes we are making for the opposition’s goals are incredible. Edinburgh City: Antell, Thomson, McIntyre, Black, Balatoni, Laird, Smith (Galbraith 85), B Henderson, Shepherd (Watson 71), L Henderson, Breen (Walker 62). Subs: Morton, Taylor, Rodger, Donaldson. Albion Rovers: Morrison, Hardie, Trialist, Wharton (Ross 76), Krones, Fagan, Reilly, Fotheringham, Newell, Escuriola (Russell 70), Wilson. Subs: Potts, Watson, McMahon, McGeouch, Gordon.